Sync your Zaurus with iCal, AddressBook, more. Is there a better alternative to ZMacSync? Is ZMacSync really the best app in Personal Info Managers category? Will ZMacSync work good on macOS 10.13.4? 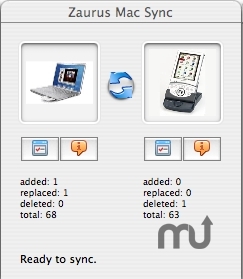 ZMacSync is a tool to keep the Sharp Zaurus Personal Information in sync with the standard Communication suite of the Apple Mac (MacOS X). This includes the Address Book, iCal calendars and to-do lists, as well as the Zaurus system clock. Synchronization is optimized so that only records are interchanged that are added, modified or deleted with as low data transformation loss as possible. User settings allow to completely protect against modification of certain data areas. Sharp Zaurus (ROM 3.10 or 1.2 or later). ZMacSync needs a rating. Be the first to rate this app and get the discussion started!